I was beyond thrilled when I was given the chance to review this book. If you read my blog often you will know that Dan and I are huge music lovers. Dan has proclaimed this book as his favorite of any book I've ever reviewed. It is a beautiful coffee table book, filled with amazing photographs and narrated by rhyming prose that puts me in mind of Dr. Seuss. The words and pictures do a wonderful job of capturing a truly remarkable event, an event that my kids were pretty much clueless about until this book arrived. 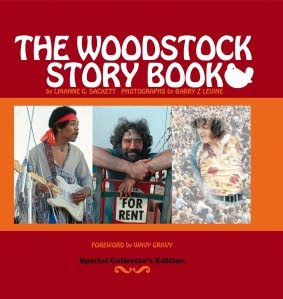 We all sat and looked through it, the kids amazed the amount of people who attended Woodstock. I of course was familiar with Woodstock, but hearing the number of people and seeing the photo of the crowds are two completely different things. The images took my breath away. Click here to check out some of these photos and read more about the book. This book will grace our coffee table for years to come. We all learned something from it, even the kids. Best of all it peaked their interest in some of the greatest rock musicians of all time. Tristen has become a Hendrix fan now. It's so cool when your kids and you share a love of the same music. Even Ashley liked it, despite the "nakey" little kids on stage in one photo. It gets two thumbs up from the whole family. I could not give this book any higher praise. Keep it in mind for those hard to buy for folks on your Christmas list. I don't know anyone who wouldn't be thrilled to own this beautiful look back at the most amazing rock festival ever!